allergy sufferers, beware: global warming could bring more hay fever, according to us government research that shows ragweed produces significantly more pollen as carbon dioxide increases. The ubiquitous weed makes nearly twice as much pollen now as it did 100 years ago and is likely to double its production over the next century with predicted increases in carbon dioxide levels, suggests a study by the us department of agriculture ( usda ). "This research may help us understand the troubling impact of high carbon dioxide levels on our environment and our health," says agriculture secretary Dan Glickman. About 15-20 per cent of the population in usa has hay fever -- or allergic reactions to plant pollen, dust and other airborne particles -- and ragweed is the major cause of the problem in the fall. The plant is found all over the country. The pollen grains are so small that they can travel many kilometres. A laboratory study done by usda in 1998 and 1999 found that ragweed pollen counts went from 5.5 grammes per plant at carbon dioxide levels that existed in 1900 to 10 grammes at current levels. At predicted carbon dioxide levels in the year 2100, the pollen count would reach 20 grammes per plant. Results of usda 's laboratory study will soon be published in the World Resource Review , a journal on climate change. Scientists at Harvard University, usa, are doing similar research this year. "This is a pretty good first sign that climate change will be a problem for allergy sufferers," said Cynthia Rosenzweig, a senior scientist at Columbia University's Centre for Climate Systems Research. Many scientists believe the Earth has been warming up for a century. This warming has accelerated over the past 20 years. The warming has been linked to a "greenhouse effect" caused by human-made pollution and increased concentrations of carbon dioxide in the atmosphere. While that could be good for farmers, because higher levels of carbon dioxide would increase some crop yields, it also could aggravate weed problems, and the effects on allergies and other health concerns have not been studied sufficiently, says Rosenzweig. Plants, which use carbon dioxide for photosynthesis, react to the gas differently. An earlier study found that trees exposed to increased carbon dioxide grow 25 per cent faster than those without it. The usda researchers expanded their ragweed study this year by planting the weed in controlled conditions in Maryland. Plants that were set out in Baltimore, where it is hotter and carbon dioxide levels are higher than outside the city, are growing significantly faster than at a rural site, said Lewis Ziska, a plant physiologist who is leading the research. 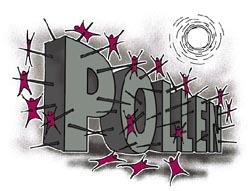 "The ones that are growing in the city are bigger and have more pollen," Ziska said. But even if pollen production does grow as carbon dioxide levels increase, it remains to be seen how that will affect individual allergy sufferers, researchers say. This is because sensitivity levels vary among people who are allergic to ragweed, said Robert Bush, an allergy specialist at the University of Wisconsin medical school. For people who are highly sensitive, "once you reach a certain threshold, adding more pollen to those people isn't going to make a lot of difference," he said.